A recent survey of nearly 2,000 people throughout China found that 93% supported maintaining the tiger trade ban. The large-scale Chinese survey also found that 95% of the Chinese public would take actions to preserve wild tigers, including refusing to purchase tiger products. Tiger products are used in traditional Chinese medicine as remedies for conditions such as arthritis. However, modern research indicates that tiger bones are no more likely to provide medicinal benefits than pig or dog bones, and the Chinese medical community has lately been embracing tiger-free alternatives. It is the owners of tiger factory farms who stand to make huge profits from the sale of tiger products, and it is these wealthy farmers, rather than the Chinese public, who are demanding that the ban on the tiger trade be lifted. By contrast, many leading traditional Chinese medicine manufacturers have argued against reopening the tiger trade as it would harm the reputation of traditional Chinese medicine. Also, many leaders of communities that once used tiger skins for traditional dress now encourage their people to discontinue wearing the skins of endangered animals. Despite recent poll results and the shift in traditional practices, owners of tiger factory farms, which have bred approximately 5,000 tigers, are lobbying for the legalization of the tiger trade. They stand to make enormous profits from the sale of tiger products, including a tonic wine that is made from tiger bones. Many believe that maintaining the tiger trade ban will have adverse effects on the ability of the rural poor to earn a living. However, the reality is that those who stand to benefit financially from the tiger trade are affluent farmers and medicine sellers, as well as the criminal networks that will increase their poaching activities if the 1993 ban is lifted. It would be difficult, if not impossible, to identify whether tiger parts for sale had come from legalized tiger farming or the illegal killing of endangered wild tigers, making it easier for poachers to sell wild tiger parts. It is far more expensive to raise farm tigers than to kill wild tigers, which would make wild tiger products more cost-effective. Farmed tiger parts would be significantly more expensive, and so consumers would seek out the cheaper wild tiger products. Of those in China who have purchased tiger products in recent years, an overwhelming majority prefer those made from wild tigers over farmed tiger products. Legalizing the tiger trade would likely increase the demand for tiger parts as many new customers who previously did not want to break the law would become interested in acquiring legal products. Overall, it is feared that lifting the ban will encourage poachers to kill even more wild tigers. As such, wild tigers would be better served by maintaining and more aggressively enforcing the ban on the tiger trade. In Asia, 3 of the original 18 tiger species have already been lost, and others are in danger of extinction. There are more than twice as many tigers in various zoos and other places of captivity than there are in the wild, and there are nearly as many tigers on factory farms as there are wild tigers. While some argue that farmed tigers could eventually be released into the wild to replenish the dwindling tiger population, this is not a feasible option. 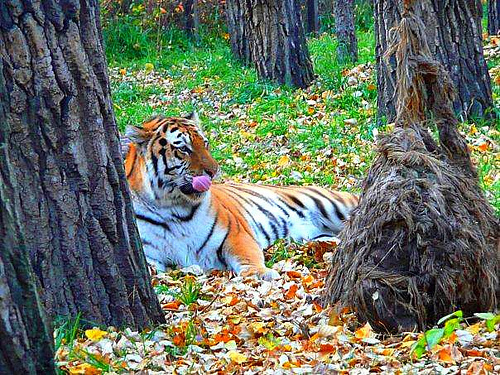 Farmed tigers lack the survival skills required for wild living. Also, they would not fear humans, which would make them easy targets for poachers. For in-depth information on tiger conservation efforts, visit SavetheTigerFund.org. Ghosh, Nirmal. (2006). “Protection, Not Farming, Will Save the Tiger.” SavetheTigerFund.org. International Fund for Animal Welfare (IFAW). (30 January 2008). “New Poll Shows an Overwhelming Majority of Chinese Public Supports Ban on Tiger Trade.” IFAW.org. National Fish and Wildlife Foundation. (2008). “Tiger Trade Facts and Fallacies.” SavetheTigerFund.org. Nielsen, John. (26 February 2006). “Could Tiger Farms Save a Species?” NPR.org.